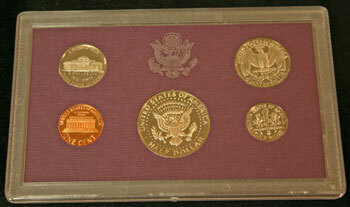 In 1984, the US Mint introduced the purple proof set package containing five proof coins with a face value of $0.91. 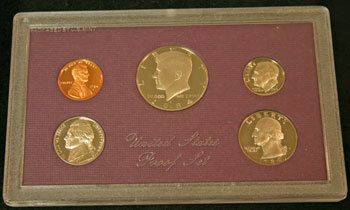 The purple box and inner core of the proof set lens would be used by the Mint through 1993. 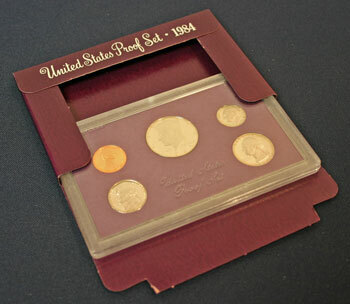 The 1984 proof set included the Lincoln cent, Jefferson nickel, Roosevelt dime, Washington quarter and Kennedy half dollar at an original cost of $11.00 from the US Mint. The 1984 proof set used a similar design as earlier packaging in the outer box, however instead of a smooth finish, the purple box had a textured finish. The purple color of the box is between true purple and true burgundy. As in earlier designs, silver script identifies the set as "United States Proof Set • 1984" on the top flap of the purple box. The box dimensions are roughly 3.5 inches by 5.5 inches by 3/8 inch. 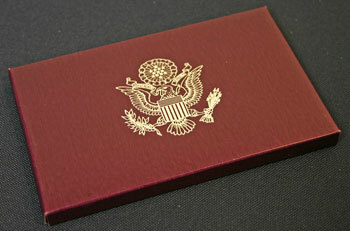 Unlike the earlier sets, the back of the 1984 proof set box contains a silver heraldic eagle with a banner showing "E PLURIBUS UNUM" in his beak and an olive branch and arrows held in his talons. A shield with thirteen bars protects the eagle's chest and above his head, a circle holds a star which consists of thirteen stars. The proof set opens by pulling the larger purple flap from under the written edge. The lens holding the coins slides out of the box from the long edge. In 1984, the Mint made improvements to their penny dies but the overall design did not change. The improvements primarily helped the dies make the single strikes on the circulating coins be cleaner and clearer. Though there were some doubled ear varieties of the Lincoln cent, they were not in the 1984 proof sets. 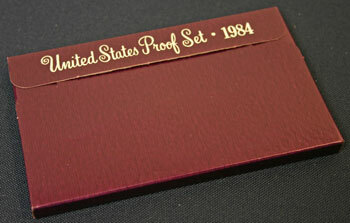 In 1984, the US Mint continued their Prestige Proof Set program. The 1984 Prestige Proof Set contained the five regular proof coins along with a commemorative silver dollar showing the colliseum in Los Angeles, the host of the XXIII Olympiad. In the regular proof set, the five coins are evenly spaced and held securely in the purple textured insert sandwiched between the two clear pieces of plastic. "United States Proof Set" in clear script is centered below the Kennedy half dollar. In the upper left corner, clear block letters denote "PACKAGED BY U.S. MINT." Turning the set over, the coins' reverse designs can be easily seen through the clear plastic. Another heraldic eagle, like the one on the proof set box, is centered above the reverse of the half dollar but in clear raised plastic. The world population in 1984 was 4,776,733,167. This represents 69.7% of the world's population in 2010. $100 in 1984 equals $209.87 in 2010 dollars using the Bureau of Labor Statistics' Inflation Calculator. New houses in 1984 cost an average of $97,600 which would be $204,833 in 2010 dollars. The average income was $16,135 per year which equals $33,863 in 2010 dollars. Gas was $1.129 per gallon which would be $2.369 in 2010 money. The average new car was $11,375 equivalent to $23,872 in 2010.